Printed from http://www.bodytalksystem.com//learn/news/article.cfm?id=872 on Apr 22, 2019. Our purpose is three-fold: To provide affordable access of BodyTalk and BodyTalk Access sessions to lower-income citizens and their children within the community; To provide a professional Mentorship forum for Practitioner Trainees to gain the practice and skills to become Certified BodyTalk Practitioners; and to promote the public and professional awareness of the BodyTalk System as a professional and effective community health-care system. On a warm evening in August, 2012, Jussara Lourenco and I met over coffee in the Little Portugal area of Toronto to discuss the idea of starting a community clinic. Our vision was to create a place where students of the Fundamentals could practice their BodyTalk skills with the guidance of CBP's, while offering low-income clients affordable, by-donation sessions. Jussara had taken a Fundamentals course I had coordinated in 2011, having heard about BodyTalk through her Brazilian friend. I had done some volunteer BodyTalk sessions with some of Jussara's clients at the community organization where she is a counsellor for abused women and children. We both saw a great need for low-cost sessions for those going through crisis in our city. We also recognized the benefits for the over-all Toronto BodyTalk matrix to create a practice space with mentoring from CBP's for BodyTalk Fundamentals students working towards their certification. Fortunately, Jussara is a member of Joanna de Angelis Spiritist Study Group - JASSG, a spiritual organization that had a large centre in the west end of Toronto. As they had no activities on Mondays, and had three practice rooms available, they graciously opened their doors to us for a low by-donation rental fee. We agreed to start a trial run for the student clinic. We launched our first clinic on Monday, September 17th, 2012. It began with Jussara as the trainee and myself as mentor, and three clients that evening. We continued weekly, and word and interest spread. From Jussara's position as counsellor, there was no shortage of clients willing to try BodyTalk. As a BodyTalk coordinator in Toronto, I continually meet many Fundamentals students, and so began to spread the word in the classes. There was definitely interest from the students, but we required the help of other CBPs. So I put a call out to my colleagues in the Greater Toronto Area, and had a great response from CBPs and Trainees alike!!! On Monday, October 29th, we had 3 CBPs – Agi Papik and Lisa Schokking and myself - and 3 Trainees, and served 9 clients. Following this, I also started to spread the word in the Access classes, and Access Technicians began to come in and do Access on clients while they were waiting for their sessions. We now frequently have clients coming into the clinic just for Access balancing. In October of last year, we increased our hours due to demands of both clients and Trainees, offering sessions and practice time during the day as well as the evening. We are able to see more clients each Monday, and have more student practice time for those Trainees who are unable to come during the evening. To this point, our Trainees and CBPs have performed over 700 sessions. On February 22nd, 2014, the TBTCC had enough donations saved to sponsor 3 clients of the TBTCC to take BodyTalk Access with Cherie Carpenter, CBI, BAAT. Who has made this possible? · The dedication and commitment of our core volunteer CBPs that show up rain and shine: Dave Huff, Agi Papik, Lisa Schokking, and our new CBP graduate Jane Cricket. · The commitment and enthusiasm of Jussara Lourenco. · The generous donations of massage tables from Cherie Carpenter and Lisa Schokking. · The commitment of our BodyTalk Trainees. · Cherie Carpenter, CBI, for spreading the word about the Community Clinic to students through her newsletters. · JASSG - the organization that allows us to continue to use their space at low rental fees. · Our dedicated Office Manager and Volunteer Coordinator Tatiane Amancio, Access Technician, who has enthusiastically volunteered her time with us since November, 2012. 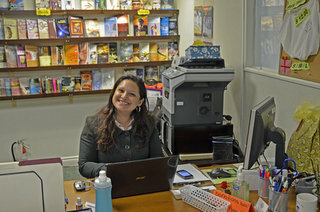 · Our new Front Office Volunteer and Access Technician Maria Picanco. We have 8 active Trainees who plan on certifying this year, and continue to attract new students and clients. In partnership with the Ontario BodyTalk Association, we are creating a formal mentoring program for our Trainees to assist them to stay on track and succeed. The future of BodyTalk is filled with potential in Toronto! "BodyTalk practitioners and students gather from across the region at the Toronto BodyTalk Community Clinic in a shared purity of intention and purpose to restore the health of those in need. With increasing global health concerns, the TBTCC is a beacon of hope for the community at large. I am eternally grateful for the opportunity that the TBTCC gave me to develop my skills as a practitioner of the BodyTalk System. The support I received from both the staff and patients was truly uplifting." 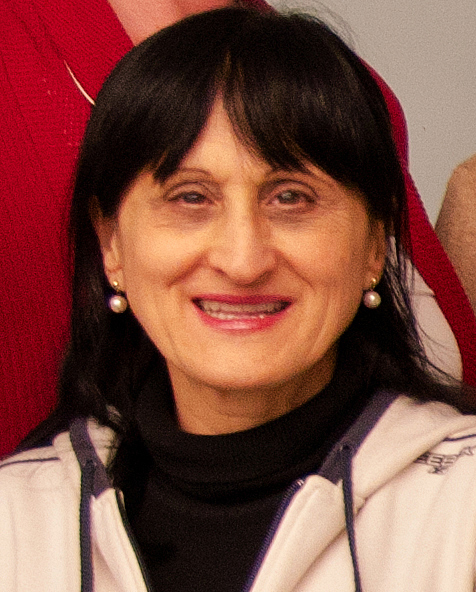 "I have volunteered several times at the Toronto Body Talk Community clinic after I got certified as a practitioner. It was an awesome experience, Linda, Tatiane, Lisa, Agi and the whole team were very warm kind and helpful. They made me feel so welcome from the very first day. I was excited to see so many clients. I worked on several clients with trainees doing the sessions as well I did sessions with the trainees observing. It was great when the trainees asked questions during sessions as this reinforced my own knowledge and skills. Also, I got to observe experienced practitioners doing sessions on clients. Linda, Lisa and Agi were all amazing, very professional yet so caring. I gained a lot of confidence and learnt a lot of additional skills which are very helpful, in my own practice. Thank you so very much, Linda and the entire team." "The Toronto BodyTalk Clinic has helped me by offering continual encouragement to learn and understand the protocol & the procedural chart. It does this with the help of more experienced CBP's observation of sessions or readiness to answer my inquiries. Sometimes the simple exchange of a session between students or CBP's can surface questions one did not know they had with a well progressed formula. These aha moments bring clarity and confidence to our work. Personally I am so appreciative to interact with people who want to bring wellness, joy, and purpose to each other's lives with BodyTalk and to those who would not be able to receive such non-invasive alternative treatments. These people are not only my peers and clients but friends who bring me blessed moments of gratitude as I inch forward to a new fulfilling purpose with every interaction. Each case I treat is unique demonstrating different levels of consciousness balancing: body mind and spirit in a healing exchange of energy between individuals. Being able to acquire case studies is great preparation towards achieving certification, health and one day a practice. Although my learning curve has slowed my resolve to push through remains because I know how BodyTalk has helped in my life and I want to give back to others. 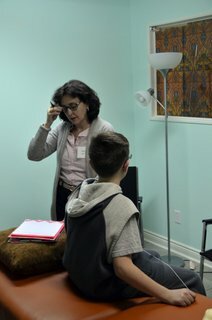 Thank you to the Toronto BodyTalk Community Clinic!" "Volunteering at the Toronto BodyTalk Community Clinic as a BodyTalker has been a great and helpful experience. It has allowed me to improve my BodyTalk knowledge, have a one-on-one experience with clients, which gives me an idea of what my future practice will be like. It has improved the way I do my sessions, so they become more accurate and take less time, thanks to the helpful mentors who are always ready for me when I need them. Practicing at the clinic has increased my confidence and given me greater trust in my intuition during sessions. I have also had sessions from my colleague BodyTalkers at the clinic when I most need one! The volunteer staff at the clinic have always been very friendly and helpful – all of this combined will hopefully help me to become a successful Certified BodyTalk Practitioner. The Clinic is also an excellent opportunity for the local low-income community to access the most complete Healthcare system available." "I am closely related to 3 communities, including the Toronto BodyTalk. Interestingly, Toronto BodyTalk is the newest among the 3, which I found out from Linda, the founder, upon the last day of Mod 1 and 2 last February. Where can we find the truly, wholly and holy "unconditional love"? At the Toronto BodyTalk Community Clinic! ...This is how my heart feels. Keep up with your beautiful work, Linda, Lisa, and Agi! From the bottom of Ellen's heart"